An encounter with Tetradenia riparia in flower in the wintry, dry bush is most surprising. There is the impression of soft lilac mist on bare grey branches, quite incongruous with the dryness of the surrounding vegetation. It is cultivated for this spectacular show which occurs when there is not much else in flower. The flowers range from white to lilac including some with pink flowers. The type of display which you will get depends on whether you have a male or female plant. 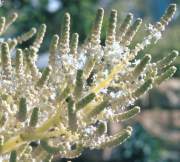 Male and female flowers are borne on separate plants in spikes which differ in size and shape. The male flower spikes in profusion create more of the "mist" effect than the female flowers which tend to be more compact. 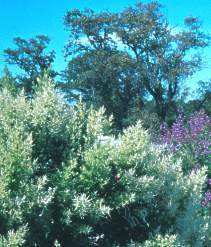 The flowers usually appear when the plants are bare and are carried in the top section of the branches. Flowering occurs from June until August which coincides with the frosts in Highveld gardens. The flowers may be spoiled by this so it is a good idea to plant the ginger bush in a warm spot such as against a north-facing wall or on a succulent rockery. The ginger bush is a tall, aromatic shrub up to 3 m in height, occasionally reaching 5 m. It is slightly succulent and has an irregular branch pattern. The stems are brown and smooth, except for the younger portions which are covered with glandular hairs and have a ruby tinge. The glandular hairs also cover both surfaces of the leaves and make them slightly sticky to the touch. The leaves are a bright green and are slightly heart shaped with the margin irregularly and bluntly toothed. Like many Lamiaceae species (which includes familiar culinary herbs such as thyme, sage and rosemary) , the younger branches are distinctly four-angled in cross section. The ginger bush is no relation of the true ginger plant of which the underground stem is commonly used for flavouring and in preserves. The natural habitat of Tetradenia riparia is along riverbanks, forest margins, dry wooded valleys and hillsides in areas where there is little frost. The natural distribution ranges from KwaZulu-Natal, Northern Province, Mpumalanga in South Africa, to Swaziland, Namibia, Angola and northwards through tropical east Africa into Ethiopia. Name derivations: Tetradenia - having four glands; riparia - growing on banks of rivers. This plant was previously classified under the genus Iboza, which was derived from its Zulu name and apparently this refers to the aromatic qualities of the plant. Tetradenia riparia is associated with a moth (Trichoplusia molybdina) of the predominately night-flying Noctuid family, but the flowers also attract other insects which are necessary to bring insect-feeding birds into your garden. The Zulu people have many uses for the plant including the relief of chest complaints, stomach ache and malaria. Inhaling the scent of the crushed leaves apparently also relieves headaches. This is a rewarding garden plant which is fast growing (up to 80 cm per year) and which will flower in its first year. It grows easily in light, well drained and well composted soil. It prefers water in summer but not as much in winter, thus making it a good water-wise plant for summer rainfall areas, especially the bushveld regions. It should be pruned back hard after flowering to keep it neat and promote flowering. Plant in full sun, except in very hot areas where midday shade or light shade will be beneficial. Tetradenia riparia is best propagated from cuttings, and even quite large truncheons can be successful. They should be rooted in river sand and monitored for any signs of rotting, as they are slightly succulent. Seed may be difficult to obtain if your garden has only male or female plants in it. The flowering stems do well in water for flower arranging. Wonderful aroma when brushing against this plant!